EAST VILLAGE — A four story health club and "physical culture" center with up to 21,000 feet in floor space is being proposed for Avenue A, according to Department of Building records and the Community Board 3 website. While the $25,000 renovation plan on the DOB website has been listed as disapproved, the applicant is scheduled to seek support for the proposal from CB3's Land Use, Zoning, Public and Private Housing Committee on April 8, according to the board's website. 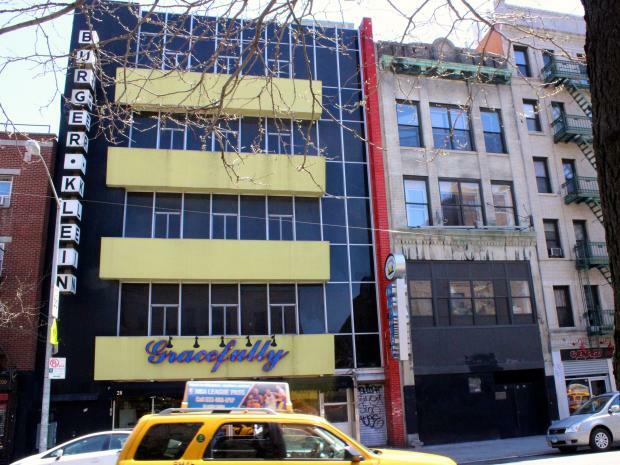 The new health club would occupy the location known as the Burger Klein Building, between 2nd and 3rd streets, with its mostly class façade and bright yellow balcony that currently has deli and grocery Gracefully operating on the ground floor. In February, local blog EV Grieve referred to rumors that a New York Health & Racquet Club was headed to the building. A spokeswoman for the club, April Riegler, denied the club had any plans to open a location in the building. The owner of the building is listed as Charanjit Singh and the architect of the renovations is listed as Mark Carelli, according to the DOB website. Angie Silva, the vice president at Outsource Consultants, which deals with building code, zoning and permit expediting, filed the building application. Singh did not return a call for comment and Silva and Carelli declined to comment on the plans. The DOB rejected the initial application due to incomplete paperwork according to department spokeswoman Gloria Chin. "The plans were not completed," she told DNAinto. The building dates back to 1871 and was once known as Concordia Hall when it operated as a German club house according to the Greenwich Village Society for Historic Preservation. From the 1930s building housed furniture it housed furniture seller Burger-Klein and surveyed a four alarm fire in 1959 according to GVSHP.